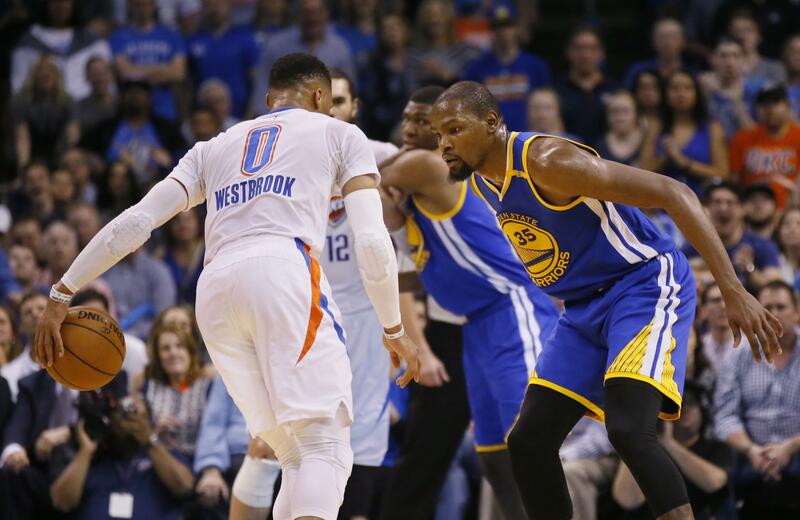 OKLAHOMA CITY – Kevin Durant scored 34 points while being booed throughout his return to Oklahoma City, and the Golden State Warriors beat the Thunder 130-114 in a chippy game on Saturday night. It was Durant’s first game back since he left the Thunder after eight seasons in Oklahoma City to join the rival Warriors as a free agent last summer. The crowd jeered him loudly during pregame warmups, starter introductions and whenever he touched the ball. Emotions ran high throughout the game. At one point in the third quarter, Durant and Oklahoma City’s Russell Westbrook yelled at each other as they walked toward their benches during a timeout. Later in the third quarter, Oklahoma City’s Andre Roberson fouled Durant hard, and the two got in each other’s faces and were called for double technicals. Westbrook finished with 47 points, 11 rebounds and eight assists. CLEVELAND – LeBron James and Kyrie Irving each scored 27 points and combined for three 3-pointers in Cleveland’s long-range barrage in the third quarter. James added 12 assists in 32 minutes as the defending NBA champions won for the fifth time in six February games after going 7-8 in January. Back from a four-game road trip, the Cavs didn’t find their range until after halftime, when they opened the third with an 18-0 run to take control. Irving drained two 3s on consecutive possessions, Kevin Love hit two more and James dropped another in a span of 2:43 as Cleveland pulled away and improved to 23-5 at Quicken Loans Arena. Nikola Jokic had 27 points and 13 rebounds for the Nuggets, who played their third game in four nights. PHILADELPHIA – Nerlens Noel, Robert Covington and Dario Saric each scored 19 points to lead the Philadelphia over Miami, snapping the Heat’s winning streak at 13 games. Goran Dragic had 30 points for the Heat, whose winning streak was the longest in the NBA this season, the third-best in team history and tops in league history by a sub-.500 team. Miami, which fell 1 1/2 games back of idle Detroit for the Eastern Conference’s final playoff spot, hadn’t lost since Jan. 13 at Milwaukee. Philadelphia center Joel Embiid missed his ninth straight game and 12th in the last 13 due to a bone bruise on his left knee. Team president Bryan Colangelo also revealed before the game that Embiid has a slightly torn meniscus in the same knee. Philadelphia put seven players in double figures. CHARLOTTE, N.C. – Blake Griffin had 20 points and 12 rebounds, Austin Rivers scored 16 of his 18 points in the second half and Los Angeles beat Charlotte. Griffin finished two assists shy of his second triple-double in his past three games. Jamal Crawford provided a spark off the bench, scoring 22 points while going 5 for 8 on 3-pointers. Nicolas Batum had 25 points, six rebounds and eight assists for the Hornets, who have lost nine of their past 10 games. The Clippers started 0 for 6 from the field, and the Hornets extended their lead to 11 points in the first quarter. Griffin, however, had 11 points, three rebounds and four assists in the period to help Los Angeles enter the second with a 29-27 lead. INDIANAPOLIS – Giannis Antetokoumpo had 20 points, 10 assists and eight rebounds to help Milwaukee beat Indiana. Mirza Teletovic made five 3-pointers and had 19 points, and Malcolm Brogdon and Greg Monroe each added 17 for the Bucks. C.J. Miles had six 3s and scored 23 points, and Monta Ellis and Myles Turner each had 18 points for the Pacers. They have dropped three straight after a season-best seven-game winning streak. After Indiana tied it at 62 in early in the second half, the Bucks went on a 12-2 run and took a 74-64 lead on Monroe’s dunk with 5:21 remaining in the third quarter. Monroe made a pair of free throws to make it 90-74 at the start of the fourth quarter. HOUSTON – James Harden scored 40 points in three quarters and Houston never trailed against short-handed Phoenix. Houston led by 26 at halftime and opened the second half with a 14-3 run, led by six points from Harden, to make it 91-54 with nine minutes left in the third quarter. Harden made three 3-pointers in the third quarter, capped by one from the top of the key with about 30 seconds left that gave him 40 points. He found Sam Dekker on an alley-oop after that, and the Rockets got a huge ovation when Dekker finished with a one-handed dunk to make it 111-77 entering the fourth quarter. The Suns were playing without starters Eric Bledsoe and Tyson Chandler, who didn’t make the trip for a scheduled day of rest after Phoenix played Chicago at home on Friday night. Devin Booker had 18 points for the Suns, who lost for the ninth time in 11 games. DALLAS – Wesley Matthews scored 12 of his 20 points in the first quarter, and Dallas cruised past Orlando. Dirk Nowitzki scored 14 points in 18 minutes, hitting a 3-pointer to give Dallas its first 30-point lead at 67-37 in the first minute of the third quarter before going to the bench for good a little more than six minutes later. The Mavericks won for the sixth time in eight games – including three victories against division leaders – in what’s becoming a turnaround season. Dallas’ first meeting with the Magic in November was in the middle of an eight-game losing streak, which was the longest for the Mavericks in 19 years and ended with them at 2-13. Bismack Biyombo scored 15 points, nine in a meaningless fourth quarter, as the Magic lost their fourth straight. SALT LAKE CITY – Isaiah Thomas scored 29 points and Kelly Olynyk added 19 to help the Boston Celtics defeat the Utah Jazz for their ninth win in their last 10 games. Gerald Green and Al Horford each added 16 points, and Horford also had eight rebounds. The Celtics swept the season series with Utah after beating the Jazz 115-104 on Jan. 3. Gordon Hayward scored 25 points and George Hill added 22 to lead the Jazz, who could not overcome poor shooting and struggled to get defensive stops during critical stretches. Published: Feb. 11, 2017, 10:55 p.m.